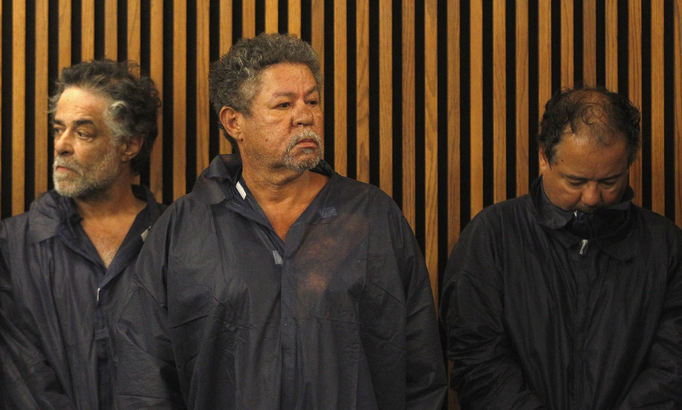 Although initially all three Castro brothers were taken into custody (from left to right on the image above, Onil Castro, Pedro Castro and Ariel Castro), Onil and Pedro have been released and at the time of this writing charges have been filed only to Ariel. This photo reveals a wealth of nonverbal information. Both Onil and Pedro have their head & neck tilted slightly back, which can indicate either arrogance, anger, pride and determination. Their eyes are opened in a normal resting state. Both also have their jaws slightly jutted out (forward) as well - a highly reliable anger display. Onil's upper lip and "mustache area" are tightened in another definitive nonverbal tell of anger. If you look at each of their left eyebrows' - they are raised in indications of disbelief. Their necks, upper chests and garments are open - and style aside, is a body language display of their relative confidence and lack of clandestine tendencies. Both of their shoulders, particularly Pedro's are squared and pulled backwards - more confident, alpha & innocent behavior. Compared to his brothers, Ariel Castro is a nonverbal study in contrast. His head and neck are bent forward with his closed eyes directed downwards. His mouth is covered with the same clothing that cloaks his upper chest & neck. No one doubts the malicious allegations against him - and neither does he. Ariel's neck is foreshortened - like a turtle trying to escape into his shell. His shoulders are hunched up, forward and rounded. His closed, covered and foreshortened neck, closed eyes and forward flexed head & neck are a highly reliable cluster of shame, guilt and psychological blocking. It's not only that he does not want to be recognized - but most importantly his psyche is trying to wipe his mind clean. His intellectual brain knows what is transpiring - however his emotional brain is trying to process the recent events and it cannot - it's playing catch up.